Superforest on 8-BIT OPERATORS BEATLES TRIBUTE. OFFWORLD on 8-BIT OPERATORS BEATLES TRIBUTE. gamesetwatch on 8-BIT OPERATORS BEATLES TRIBUTE. therumblepack.com podcast interview with Jeremy Kolosine re 8BitOps. gamemusic4all on 8-BIT OPERATORS BEATLES TRIBUTE. Blind See All blog 8-BIT OPERATORS . NPR piece on 8-BIT OPERATORS Kraftwerk tribute. 8-Bit Operators Kraftwerk tribute in Nintendo Power. Retro Thing on 8BitOps Kraftwerk tribute. 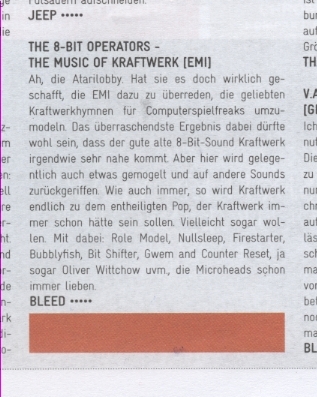 Remix Mag 4/5 stars to 8BitOps! 8-Bit Operators in New Gamer. boingboing on 8-BIT OPERATORS BEATLES TRIBUTE. digitaltools on 8-BIT OPERATORS BEATLES TRIBUTE. BBPS on 8-BIT OPERATORS BEATLES TRIBUTE. nerdcore.de on 8-BIT OPERATORS BEATLES TRIBUTE. gamemusic4all update on 8BITOPS BEATLES TRIBUTE. malangiereviews on 8-BIT OPERATORS BEATLES TRIBUTE. zomg on 8-BIT OPERATORS BEATLES TRIBUTE. anaitgames on 8-BIT OPERATORS BEATLES TRIBUTE. jinxprotocol on 8-BIT OPERATORS BEATLES TRIBUTE. cut n scratch on 8-BIT OPERATORS BEATLES TRIBUTE. startselect on 8-BIT OPERATORS BEATLES TRIBUTE. xboxahoy on 8-BIT OPERATORS BEATLES TRIBUTE. Synthtopia on 8-BIT OPERATORS BEATLES TRIBUTE. destructoid on 8-BIT OPERATORS BEATLES TRIBUTE. RP Online on 8-BIT OPERATORS BEATLES TRIBUTE(German). sonicstate on 8-BIT OPERATORS BEATLES TRIBUTE. 8-Bit Operators in Tuned in to Music. 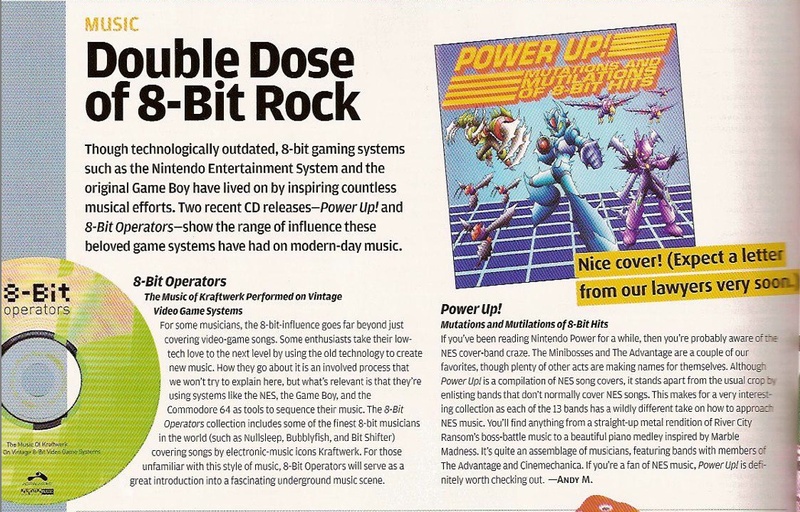 8BitOps review in Alternative Press. East Bay Express on 8BitOps. The New Gamer on 8BitOps. 8BitOps review in The Lawrentian. Dusting Em Off cites Futurisk. Minimal Wave's Veronica Vasicka interviews Futurisk's Jeremy Kolosine for The Quietus. societeperrier on Vasicka plus Futurisk. New Times County Grind on Futurisk. The Big Takeover on MW, Futurisk. ELLE Magazine: Futurisk in Veronica Vasika TOP 5.. FACT Mag on Futurisk "Lonely Streets Remixes"
Blow-Up Mag feature on Minimal Wave synth movement. Receptors featured on WFMU's Free Music Archive via TCTD. Roanoke Times on Receptors' Taubman installation. Press release for Receptors' Taubman Installation. Receptors in SPIN Mags Undiscovered Bands picks. Receptors / Blip on superantonym. Jeremy Kolosine interview on East Village Radio. * Check out IFC Channel's SXSW report on the "Blip:Reformat The Planet" movie, an interview with 2PlayerProductions and Glomag's gameboy couch demonstration!, and this well-informed take on chiptunes & SXSW, and check some BlipFest vids here.